Poland and the United States co-host the “Ministerial to Promote a Future of Peace and Security in the Middle East” in Warsaw on February 13-14. Key members of the international community have attended the Warsaw summit whose focus is on Iran and its destabilizing role in the Middle East. Simultaneous to the first day of Warsaw summit, the supporters of the Iranian resistance, National Council of Resistance of Iran (NCRI), led by Mrs. Maryam Rajavi, held a rally in Warsaw to convey the voice of the Iranian people, who demand regime change, to the international community. 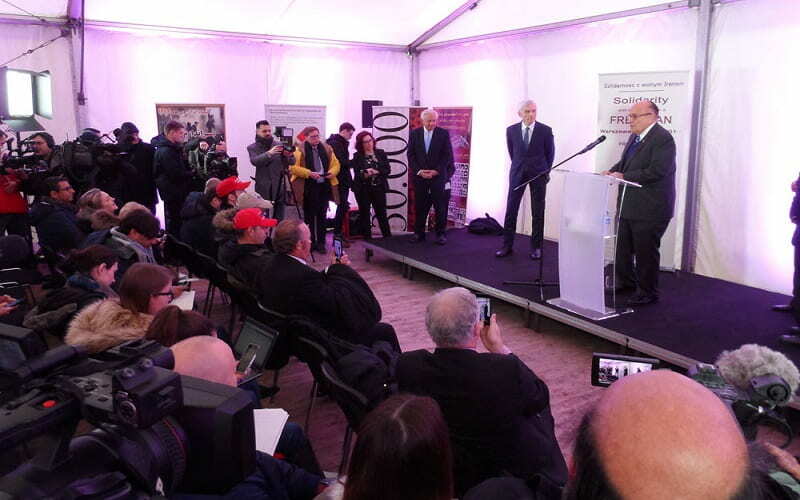 Before the rally, the former New York Mayor, Rudy Giuliani; the former Algerian Prime Minister, Sid Ahmed Ghozali; the former US Senator, Robert Torricelli, and several Polish MPs and Senators Participated in the NCRI’s press conference in Warsaw. 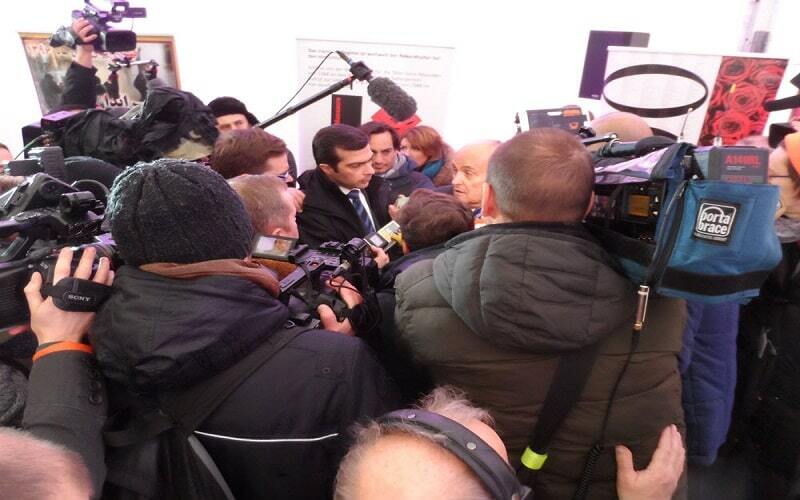 They made remarks and answered the questions on the relevant subjects to the Warsaw summit. “Iran (regime) is the number one state sponsor of terrorism in the world. We should not be doing business with a regime that supports terror. The Warsaw Summit should be focused on how we change Iran. How do we change their behavior against their people? The last two Free Iran conferences I attended, the regime tried to bomb them; the last one was in Paris. “I am here to support the democratic opposition of Iran. I have already participated in a few meetings of the Iranian opposition in Paris, and as Mayor Rudy Giuliani said, the regime tried to bomb these rallies. Poland had to fight for its freedom, and the Iranian people are doing the same. That’s why we support the democratic opposition in Iran against a regime that is suppressing its people. We support the 10-point plan of Mrs. Maryam Rajavi, equal rights for men and women, rights for minorities, religion, and freedom of choice. I am certain that this fight for democracy and to abolish a regime that does not respect human rights will be a successful one.”The next speaker to the NCRI’s press conference in Warsaw was the former Algerian Prime Minister, Sid Ahmed Ghozali. He said: “We are here as messengers of peace. We want the stability of the Middle East and all neighboring countries. The main menace is coming from state terrorism by the Iranian regime, and we see that violence in countries like Iraq, Syria, and Yemen. So we are here to support the Iranian people. This weekend marked the 40th anniversary of the fall of the Shah’s dictatorship. The people of Iran got rid of a dictatorship but got into a worse dictatorship of the mullahs. The MEK has a record of more than 50 years of resistance. We have seen a lot of sacrifices and over 120,000 have been executed by the mullahs’ regime. 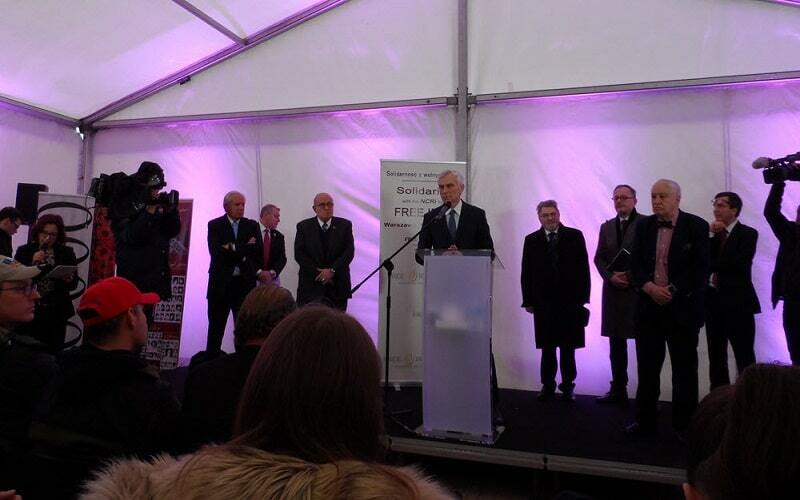 Senator Ryszard Majer, Vice President of the Foreign Affairs Committee of the Polish Senate, adressed the NCRI’s press conference in Warsaw: “Respect for the right of Iranians and freedom for the Iranian people is needed for the whole world. As a Pole, I understand this desire. For many years we lived under a dictatorship. Prisons were full of political prisoners who wanted freedom of expression. Senator Zbigniew Cichoń, from Poland’s PIS party, was the next speaker to the NCRI’s press conference in Warsaw: “We Polish people have a special attitude towards the Iranian nation because, during the 2nd World War, they had taken care of thousands of Polish soldiers who were crossing through Iran. They were hosted with great hospitality. Now the Iranian nation has to obtain its dignity and be a nation of complete freedom. We have to give the Iranian people the help they need to obtain human rights. “I have great respect for the government of Albania. They welcomed a number of people (from the PMOI/MEK) and saved their lives. In Iraq, the regime was slaughtering these people. There was a plot in Albania to bomb the MEK’s Persian New Year celebration, and that led the Albanian government to expel the Iranian ambassador.